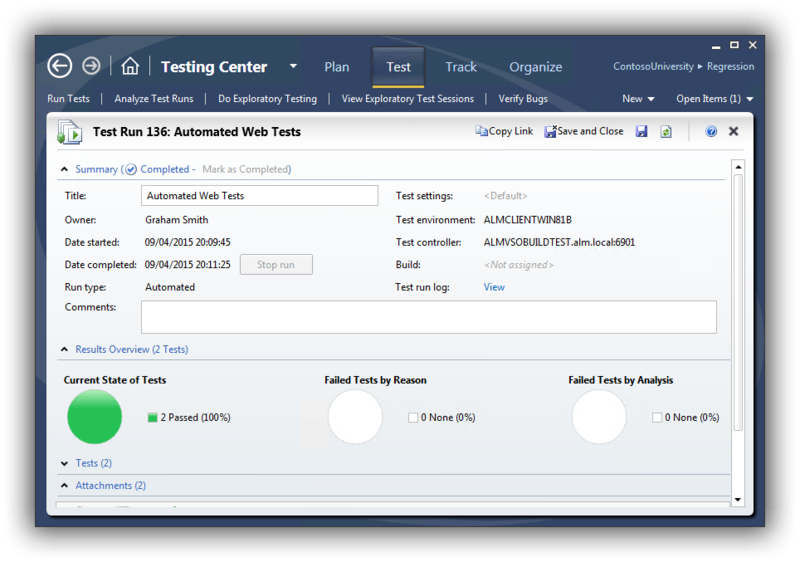 In this fourth post in my series on continuous delivery with VSO we take a look at executing automated web tests with Microsoft Test Manager. There are quite a few moving parts involved in getting all this working so it's worth me explaining the overall aim before diving in with the specifics. The tests we want to run are automated web tests written using the Selenium framework. I first wrote these tests for my Continuous Delivery with TFS blog posts series and you can read about how to create the tests here and how run run them using MTM and TFS here. The goal in this post is to run these tests using MTM and VSO, triggered as part of the DAT stage of the pipeline from RM. The tests are run from a client workstation that is configured with MTM (a requirement at the time of writing) and the Microsoft Test Agent. I've used Selenium's Firefox driver in the test code so Firefox is also required on the client machine. In terms of what actually happens, firstly RM copies the complete build over to the client workstation and then executes a PowerShell script that runs TCM.exe which is a command-line utility that lets you run tests that are part of a test plan. Precisely what happens next is under the bonnet stuff but it's along the lines of the test controller is informed that there is work to be done and that in turn informs the test agent on the client machine that it needs to run tests. The test agent knows from the test plan which tests to run and in which DLL they live and has access to the DLLs in the local copy of the build folder. Each test first starts Firefox and then connects to the web server running the deployed Contoso University and performs the automation specified in the test. In many ways the process of getting all this to work with VSO rather than TFS is very similar and because of that I don't go in to every detail in this post and instead refer back to my TFS blog post. VSO doesn't offer a test controller facility so you'll need to configure this yourself. If you have a test controller already in use then it's simplicity itself to repurpose it to point to your VSO account using the Browse button. If you are starting from scratch see here for the details but obviously ensure you connect to VSO rather than TFS. One other difference is that in order to get past some permissions problems I found it necessary to specify credentials for the lab service account -- I used the same as the service logon account. Although I started off by repurposing an existing controller, because of permissions problems I ended up creating a dedicated build and test server as I wanted to start with a clean sheet. One thing I found was that the Visual Studio Test Controller service wouldn't automatically start after booting the OS from the Stopped (deallocated) state. The application error log was clearly reporting that the test controller wasn't able to connect to VSO. Manually starting the service was fine so presumably there was some sort of timing issue with other OS components not being ready. If MTM isn't already installed on your development workstation then that's the first step. The second step is to connect MTM to your VSO account. I already had MTM installed and when I went to connect it to VSO the website was already listed. If that's not the case you can use the Add server link from the Connect to Your Team Project dialog. Navigating down to your Team Project (ContosoUniversity) enables the Connect now link which then takes you to a screen that allows you to choose between Testing Center and Lab Center. Choose the latter and then configure Lab Center as per the instructions here. Continue following these instructions to configure Testing Centre with a new test plan and test cases. 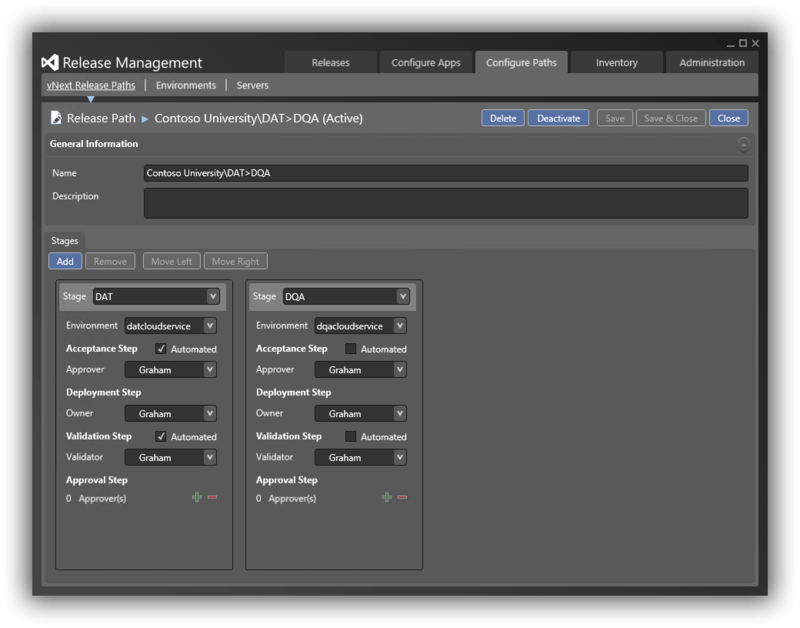 Note that you need to have the Contoso University solution open in order to associate the actual tests with the test cases. You'll also need to ensure that when deployed the tests navigate to the correct URL. In the Contoso University demo application this is hard-coded and you need to make the change in Driver.cs located in the ContosoUniversity.Web.SeFramework project. The client test machine needs to be created in the cloud service that was created for DAT and joined to the domain if you are using one. The required configuration is very similar to that required for TFS as described here with the exception that the Release Management Deployment Agent isn't required and nor is the RMDEPLOYER account. Getting permissions correctly configured on this machine proved critical and I eventually realised that the Windows account that the tests will run under needs to be configured so that MTM can successfully connect to VSO with the appropriate credentials. To be clear, these are not the test account credentials themselves but rather the normal credentials you use to connect to VSO. To configure all this, once the test account has been added to the Local Administrators group and MTM has been installed and the licence key applied you will need to log on to Windows as the test account and start MTM. Connect to VSO and supply your VSO credentials in the same way as you did for your development workstation and and verify that you can navigate down to the Contoso University team project and open the test plan that was created in the previous section. Initially I also battled with getting the test agent to register correctly with the test controller. I eventually uninstalled the test agent (which I had installed manually) and let the test controller perform the install followed by the configuration. Whether that was the real solution to the problem I don't know but it got things working for me. As mentioned above the code that starts the tests is a PowerShell script that executes TCM.exe. As a starting point I used the script that Microsoft developed for agent-based release templates but had to modify it to make it work with RM-VSO. In particular changes were made to accommodate the way variables are passed in to the script (some implicit such as $TfsUrl or $TeamProject and some explicit such as $PlanId or $SuiteId) and to remove the optional build definition and build number parameters which are not available to the vNext pipeline and caused errors when specified on the TCM.exe command line. The modified script (TcmExecvNext.ps1) and the original Microsoft script for comparison (TcmExec.ps1) are available in a zip here and TcmExecvNext.ps1 should be copied to the Deploy folder in your source control root. One point to note is that for agent-based pipelines to TFS Collection URL is passed as $TfsUrlWithCollection however in vNext pipelines it is passed in as $TfsUrl. Because we are using RM-VSO this part of the configuration is completely different from the instructions for RM-TFS. However before starting any new configuration you'll need to make a change to the component we created in the previous post. This is because TCM.exe doesn't seem to like accepting the name of a build folder if it has a space in it. Some more fiddling with PowerShell might have found a solution but I eventailly changed the component's name from Drop Folder to DropFolder. Note that you'll need to visit the existing action and reselect the newly named component. Another issue which cropped-up is that TCM.exe choked when the build directory parameter was supplied with a local file path. The answer was to create a share at C:\Windows\DtlDownloads\DropFolder and configure with appropriate permissions. From Configure Paths > Environments link the web client test machine to the DAT environment. From Configure Apps > vNext Release Templates open Contoso University\DAT>DQA. 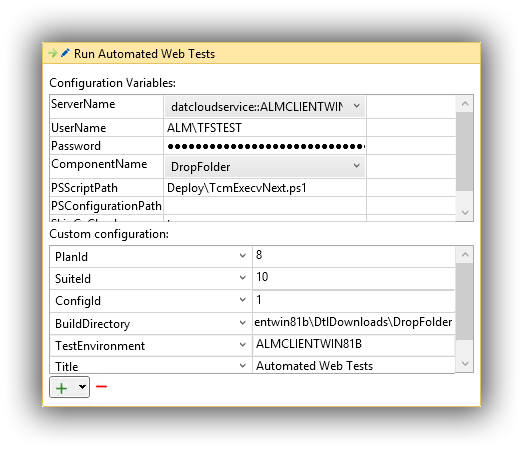 From the Toolbox drag a Deploy Using PS/DSC action to the deployment sequence to follow Deploy Web and Database and rename the action Run Automated Web Tests. ServerName = choose the name of the web client test machine from the dropdown. UserName = this is the test domain account (ALM\TFSTEST in my case) that was configured for the web client test machine. ComponentName = choose DropFolder from the dropdown. As I noted in the TFS version of this post there are a lot of moving parts to get configured and working in order to be able to trigger tests to run from RM. Making all this work with VSO took many hours working through all the details and battling with permissions problems and myriad other things that didn't work in the way I was expecting them to. With luck I've hopefully captured all the details you need to try this in your own environment. If you do encounter difficulties please post in the comments and I'll do what I can to help. The first thing you are going to want to sort out is build. VSO comes with 60 minutes of bundled build which disappears in no time. You can pay for more by linking your VSO account to an Azure subscription that has billing activated or the alternative is to use your own build server. This second option turns out to be ridiculously easy and Anthony Borton has a great post on how to do this starting from scratch here. However if you already have a build server configured it's a moment's work to reconfigure it for VSO. From Team Foundation Server Administration Console choose the Build Configuration node and select the Properties of the build controller. Stop the service and then use the familiar dialogs to connect to your VSO URL. Configure a new controller and agent and that's it! Create folders called Build and Deploy in the root of your version control for ContosoUniversity and check them in. Check CopyDeployFiles.ps1 in to source control. To explain, Post-build script path specifies that CopyDeployFiles.ps1 created above should be run and Post-build script arguments feeds in the -pathToCopy argument which is the Deploy folder we created above. The net effect of all this is that the Deploy folder and any contents gets created as part of the build. With that noted create a component called Drop Folder and add a backslash (\) to Source > Builds with application > Path to package. The net effect of this when the deployment has taken place is the existence a folder called Drop Folder on the target node with the contents of the original drop folder copied over to the remote folder. As long as we don't need to create configuration variables for the component it can be reused in this basic form. It probably needs a better name though. Right-click the Components node of the Toolbox and Add the Drop Folder component. 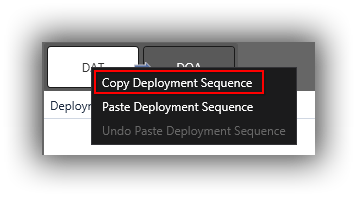 Expand the Actions node of the Toolbox and drag a Deploy Using PS/DSC action to the Deployment Sequence. Click the pen icon to rename to Deploy Web and Database. ServerName = choose the appropriate server from the dropdown. UserName = the name of an account that has permissions on the target node. I'm using the RMDEPLOYER domain account that was set up for Deployment Agents to use in agent based deployments. ComponentName = choose Drop Folder from the dropdown. At this stage we can save the template and trigger a build. If everything is working you should be able to examine the target node and observe a folder called C:\Windows\DtlDownloads\Drop Folder that contains the build. The first section of the script will deploy the web files to C:\inetpub\wwwroot\CU-DAT on the target node, so create this folder if you haven't already. Obviously we could get PowerShell to do this but I'm keeping things simple. I'm using functions in WebAndDatabase.ps1 to keep things neat and tidy and to make debugging a bit easier if I want to only run one function. The code clears out the current set of web files and then copies the new set over. The tokens in Web.config get changed in the copied set so the originals can be used for the DQA stage. Note how I'm using Write-Verbose statements with the -Verbose switch at the end. This causes the RM Deployment Log grid to display a View Log link in the Command Output column. Very handy for debugging purposes. $cmd = "& 'C:\Program Files (x86)\Microsoft SQL Server\120\DAC\bin\sqlpackage.exe' /a:Publish /sf:'$ApplicationPath'\'$dacpacName' /tcs:'server=$databaseServer; initial catalog=$databaseName'"
The code is simply building the command to run sqlpackage.exe -- pretty straightforward. Note that the script is hardcoded to SQL Server 2014 -- more on that below. The final function deals with the Create login and database user.sql script that lives in the Scripts folder of the ContosoUniversity.Database project. This script ensures that the necessary SQL Server login and database user exists and is tokenised so it can be used in different stages -- see this article for all the details. $scriptName = "$ApplicationPath\Scripts\Create login and database user.sql"
$cmd = "& 'sqlcmd' /S $databaseServer /i '$scriptName' "
The tokens in the SQL script are first swapped for passed-in values and then the code builds a command to run the script. Again, pretty straightforward. At this stage you should be able to trigger a build and have all of the components deploy. In order to fully test that everything is working you'll want to create and configure a web application in IIS -- this article has the details. One remaining aspect to cover is the subject of script reusability. With RM-TFS there is an out-of-the-box way to achieve reusability with tools and actions. This isn't available in RM-VSO and instead potential reusability comes via storing scripts outside of the Visual Studio solution. This needs some thought though since the all-in-one script used above (by necessity) only has limited reusability and in a non-demo environment you would want to consider splitting the script and co-ordinating everything from a master script. Some of this would happen anyway if the web and database servers were distinct machines but there is probably more that should be done. For example, tokens that are to be swapped-out are hard-coded in the script above which limits reusability. I've left it like that for readability but this certainly feels like the sort of thing that should be improved upon. In a similar vein the path to sqlpackage.exe is hard coded and thus tied to a specific version of SQL Server and probably needs addressing. In the next post we'll look at executing automated web tests. Meantime if you have any thoughts on great ways to use PowerShell with RM-VSO please do share in the comments. 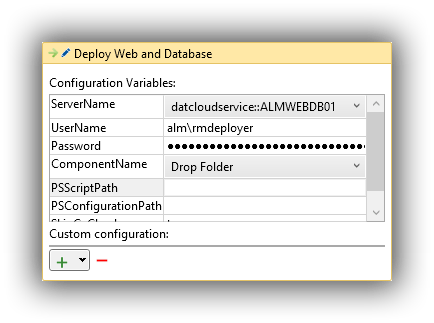 In this post in my blog series on continuous delivery with VSO we look at configuring Release Management for Visual Studio. RM is part of the TFS ecosystem and is used to deploy our code to the different environments that constitute the delivery pipeline. It was originally built to work with TFS however the 2013.4 version released in November 2014 now works with VSO. Inevitably of course I'm going to be comparing how RM with VSO stacks up against RM with TFS. One of the big advantages of RM-VSO is that there is no need to run a TFS instance. Additionally there is no need to run an RM server instance or Deployment Agents on target nodes since this is all taken care of, either behind the scenes in the case of the RM server or by using a different technique in the case of deploying to target nodes. Whilst the RM-VSO offering reduces the number of moving parts (which is good) it also imposes restrictions. As an example, RM-TFS allows us to reuse deployment VMs in different environments. In contrast RM-VSO doesn't allow this and consequently a multi-tenant model (eg one IIS machine hosting multiple websites) isn't possible, at least not without a substantial amount of jiggery-pokery. Does this matter? It depends... For a demo environment fewer VMs is preferable if you need to preserve your Azure credits, but in vivo you probably want separate VMs anyway. There is an easy -- if inelegant -- workaround for those that want to preserve Azure credits and I describe this below. In the Azure portal create two new cloud services to host VMs for each RM-VSO environment. I called mine datcloudservice.cloudapp.net and dqacloudservice.cloudapp.net -- you'll need to choose unique names for your services. Now create two new VMs -- one in each cloud service. I called mine ALMWEBDB01 and ALMWEBDB02. The good news is that despite being in different cloud services these servers can be in the same virtual network, affinity group and storage account. This keeps everything neat and tidy and also means the servers can be part of your domain if you have set one up. Both of these servers need to have IIS and SQL Server installed. This is fairly standard stuff so I won't be covering this here. One note of caution is that to preserve Azure credits be sure to install SQL Server from scratch rather than use an image from the gallery with SQL Server pre-installed as the latter technique is much more costly. These servers also need an account adding to the local administrators group that will be used in the deployment process. I used the RMDEPLOYER domain account that was set up for Deployment Agents to use in agent based deployments. In addition RMDEPLOYER will need a login for SQL Server and appropriate permissions. The easy path in a demo environment is to grant sysadmin but clearly that may be unwise in production. The other VM which is core to all this is your developer workstation running Visual Studio, Release Management and Microsoft Test Manager. See above for the link to getting this machine configured if necessary. In the Configure Services dialog that appears add in the URL of your VSO account, ie https://myaccount.visualstudio.com. You'll probably be prompted to enter credentials after which you'll be prompted to allow the client to restart. When it does you have an instance of the client ‘re-branded' for VSO, by which I mean there are some changes to the user interface to reflect the difference between the features supported by TFS and VSO. One immediately obvious difference is that there is no place to specify SMTP settings as VSO handles all that. Download a text file containing your Azure subscription settings from here. From Administration > Manage Azure click on New and fill in the Name, Subscription ID and Management Certificate Key from the text file. Pay particular attention if you have more than one Azure subscription. For the Management Certificate Key you want everything between the quotes. Get the appropriate Storage Account Name from here. Consider deleting the Azure subscription settings file when you are finished with it for security purposes. Create DAT and DQC stages from Administration > Manage Pick Lists. See here for my TFS equivalent post. From Configure Paths > Environments click on New vNext: Azure to create a new environment and click Link Azure Environment to bring up the Azure Environments dialog. Select your Azure subscription and then use the Link button to link the DAT cloud service. Note that you can't change the name of the environment -- it is fixed as the name of the cloud service. Again there are differences between the VSO version and the TFS version, since for some reason the toggle email notification icons are missing from the VSO version. Other than that createing a release path with RM-VSO is very similar to RM-TFS. That's as far as we are going in this post. Next time we'll configure the actual release template and get to grips with using PowerShell scripts to deploy our components. 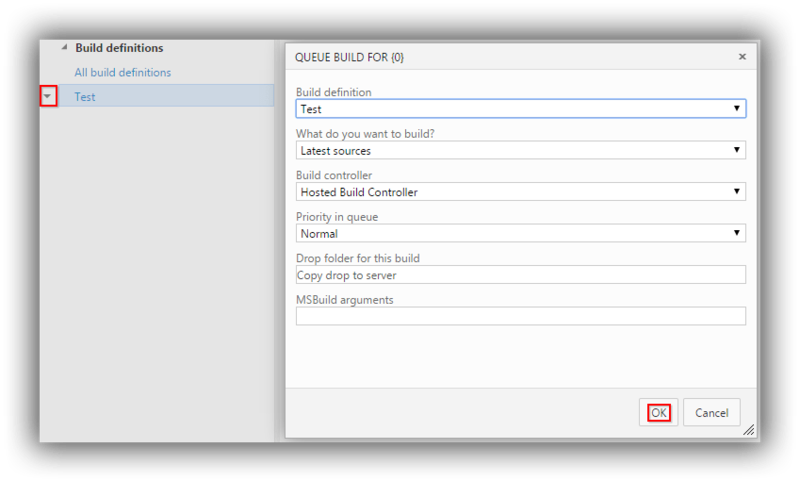 In this first post on my series on implementing continuous delivery with Visual Studio Online we look at configuring the basics, including setting up an account and linking in to Visual Studio. As usual I assume a degree of familiarity with the tooling and if you need to get up to speed with VSO I have a getting started post here. I also assume that you already have a Microsoft account and I'll be writing the series from the perspective of someone with an MSDN subscription who has access to Microsoft software and Azure credits. If that's not you then all is not lost since much of the tooling is available for free or as trial versions. Our journey begins by creating a new VSO account. Head over to this page and sign in with your Microsoft account. Under the Accounts list there is a Create a free account now link which allows you to create a new account using a unique URL ending in visualstudio.com. A fairly recent addition is the ability to have the account hosted in West Europe by clicking Change options. Once created you should see your account listed with any other accounts that you have created or have been invited to join. The first time you visit your account (analogous to a Team Project Collection in on-premise TFS) you will need to Create your first project which is analogous to a Team Project. I created a project called ContosoUniversity based on the Microsoft Visual Studio Scrum 2013.4 process template and using Team Foundation Version Control. Once your new project is created the next step is to hook it up to Visual Studio 2013. You can do this from the Overview page of your new project if you have the account open in a browser running on your development machine or you can do as I did and manually connect in Visual Studio via Team Explorer -- Connect. I added a new server using https://pleasereleaseme.visualstudio.com and that was all that was required for Visual Studio to prompt me for credentials. With the account added the next step is to map a workspace. I'd previously mapped ContosoUniversity to the TFS version of the project and the filepath was already in use so I added a VSO folder before the project name to keep everything tidy and avoid a ContosoUniversity2 folder. Next up is to add the ContosoUniversity source code to version control under a Main folder that is configured as a branch -- see this post for fuller details. If you have your own version of ContosoUniversity from my TFS blog post series that you want to use then go ahead (see here for a utility to unbind the solution from version control prior to copying it over) or you can download a zip of the code from here. At this point you should be able to publish the database to LocalDb and run the application. As a final step to getting the basics configured we'll create and run a build. Although there is a Build area within VSO you can't actually create a build here, and you need to do that from within Visual Studio. From Team Explorer choose Builds and then New Build Definition. The process is very similar to the one for the full-blown TFS I describe here. The main differences are that in Build Defaults I left Staging Location set to Copy build output to server and in Process I chose the TfvcTemplate.12.xaml build process template and in Automated Tests I changed test to unittests to stop the automated web tests from running. I also set 5. Advanced > MSBuild arguments to /p:UseWPP_CopyWebApplication=true /p:PipelineDependsOnBuild=false to ensure that the web.config transform that gives the tokenised version takes place. To finish off, the initial impression of VSO is that it's very slick and extremely well integrated with Visual Studio. It's certainly orders of magnitude easier to set up than TFS. Does it have all the flexibility of TFS when it comes to continuous delivery? We'll start to find out over the next few posts. In another series of blog posts on this website I describe how to implement continuous delivery with TFS. I start from scratch by describing how to install and configure TFS and there's no denying that it's quite a lot of work. Once installed TFS can require a not inconsiderable amount of care and feeding and in bigger organisations it's almost certainly going to be someone's full-time job. There is an alternative though -- Visual Studio Online. This is a SaaS version of TFS hosted in Azure, and started life as Team Foundation Service back in 2012. The name change coincided with the release of Visual Studio 2013 in November 2013. VSO isn't the full-blown TFS as it's missing the SSRS reporting capabilities and the SharePoint portal integration. At the time of writing a subscription can only consist of one Team Project Collection and editing of process templates isn't supported. On the other hand, VSO receives updates approximately every three weeks so it contains new application features well ahead of TFS. A post here has a nice comparison. What you may find interesting is that as per Brian Harry's blog post Microsoft are planning to gradually move their teams currently using TFS over to VSO. If that isn't putting faith in VSO then I don't know what is! So if it's good enough for Microsoft it's surely good enough for the rest of us. But as always the key questions for some people are how to get started and can using VSO give us the nice integration with the other tools such as Microsoft Test Manager and Release Management? This blog post series will focus on answering those very questions. I'm aiming to write a soup-to-nuts guide on how to implement continuous delivery with VSO, comparing and contrasting with the TFS blog post series as we go. Do use the comments system to give me feedback!